It's simple to say failure is not an option but the more practical way to approach this is to have a realistic view of your progress and take pride in the small steps. On day three of the new year and running strong. By strong I mean that I went to Kickboxing and Yoga class and immediately felt the negative effects of the holiday season. The biggest thing that I noticed was that I was a bit dehydrated and I didn't have my full balance. Ok, so not the best inversions today but I can live with that. Why? Well, because I know that I can do them. Some might think that I am stuck on myself, narcissistic to some degree but that is far from the truth. It's just a productive way of dealing with things. In the past three plus years I have uprooted everything and got really honest with myself. With this I changed my life goals. Every day I have to deal with doubt but with each stretch, each roll and with each attempted inversion I have an example of me doing something that I thought I couldn't do. Ok, I might look like an upside down elephant and have the grace of a mule but that doesn't matter much. What does matter is that I can do it. So I try to apply this to everything in life. Sure, I have failed and more then likely I will fail again. That's part of the excitement of life. The difference is that In the past I would take that failure with me throughout the day. Does this sound failure to anyone? Maybe this is something that you do? Well, I have a secret for you. 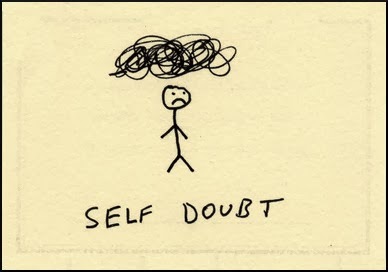 I am pretty sure that everyone deals with self doubt from time to time. It's normal! The problem is that if you don't let go of it and replace it a positive feeling that doubt sits on your back. As you go through the day, month and year you add similar feelings. Before you know it, you are carrying a super heavy load. Imagine what happens if you don't lessen that load? Gee, that seems to me that is one of the ways people get depressed. I wish I had the magical answer that fixed this for everyone but I don't. What I can share with you is that for me, taking a feeling of failure and replacing it with one of success helps me deal with the issue. It's not perfect and I'm not perfect. (see section about failure above) but it does work. There are things that happen to everyone that are far worse than failing at a desired accomplishment or goal but if you use this replacement strategy with most of your day to day issues you might be able to handle the tough stuff a little bit better. So what brought this on? Simple, my friend and the fearless leader of our weekly Obstacle run and conditioning boot camp posted something about her 2014 goals. It wasn't her goals that motivated me but the confidence that she displayed just by posting them. As I mentioned before, there are going to be down days and maybe she will miss the mark on a few but that doesn't matter. Small steps are progress and failure is only an obstacle not a barrier. W meet every Sunday to work on overcoming obstacles so she should be ok! Well that is my thought for the morning. Now back to my school work and continuing to reach my goal!